These snails were seen on a hydrothermal vent field at Chamorro Seamount that was discovered during the Okeanos Explorer 2016 Deepwater Exploration of the Marianas expedition. The R/V Falkor returned to Chamorro to further characterize the new vents in December 2016. 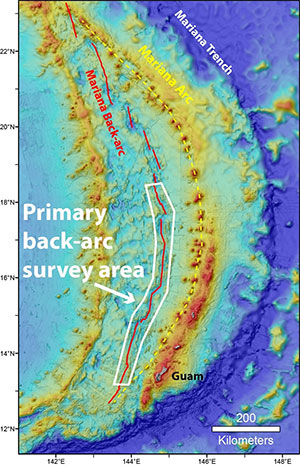 Image courtesy of NOAA Office of Ocean Exploration and Research, 2016 Deepwater Exploration of the Marianas. Download image (jpg, 262 KB). Between November 29 and December 20, 2016, a team led by scientists from the University of Washington, Oregon State University, and NOAA Pacific Marine Environmental Laboratory aboard the Schmidt Ocean Institute’s Research Vessel Falkor will travel to the Mariana Back-arc, to explore newly discovered hydrothermal vents and the life they support. A map of the planned survey area for the Hydrothermal Hunt at Mariana expedition. Image courtesy of the Schmidt Ocean Institute. Download image (jpg, 127 KB). During the expedition, the team will return to three hydrothermal vents fields that were found during a discovery cruise on the Falkor in 2015. Using the Schmidt Ocean Institute’s new remotely operated vehicle, SuBastian , scientists will visually explore and sample the newly found vent sites, to better define the relationships between geologic setting, chemical environment, and biological communities. A primary goal of the expedition is to catalog life found at the vents and to better understand their relationships to the regional biogeography. Scientists will also examine the chemistry and geology of the vents, studying their microbiology and testing ideas to explain differences between life found at volcanic arc and back-arc vents. During dives, LIVE video will be streamed online , allowing visitors to follow along. To learn more about the mission and read updates from the field, visit the expedition website .